Scott, who submitted this photo to the Apostrophe Catastrophes facebook group, writes, "I saw this in a display case in a school I visited in March. I hope it is student-generated work, and not that of a teacher." I hope so, too. 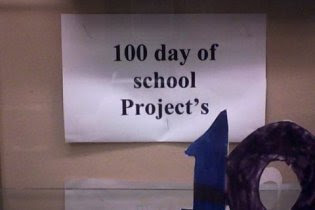 Also, another group member pointed out that the sign should say 100th, and she wondered why the p is capitalized. My friend Rob writes, "I'm fond of Yo La Tengo, but not of their new album's catastrophe!" See track 3 below. 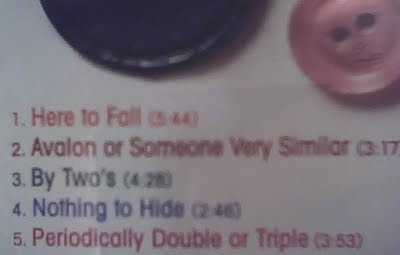 The AP Guide says not to use apostrophes to make numerals plural, so 2's would have been wrong, too. 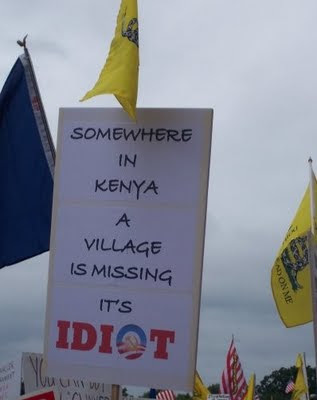 But so many apostrophe catastrophes can be found on menus, signs at the grocery store, and food stalls at county fairs. 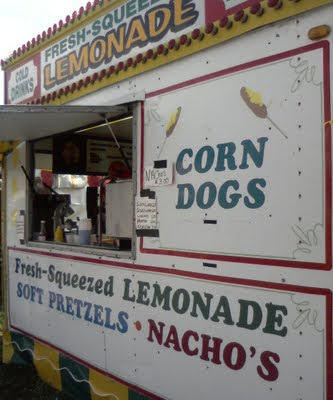 Tim in New Hampshire sent in six food-related apostrophe catastrophes, including the one above from from the Cheshire Fair. Nacho's, anyone? The founder of National Punctuation Day, Jeff Rubin, asked us to bake something in the shape of our favorite punctuation mark. But I'm not much of a baker, so I didn't know what I should do. On my way back from running some errands, I walked by an Indian grocery store/takeaway and noticed a big sign for dosa's. I looked at the menu, and decided that, in honor of NPD, I had to have one of their chicken entree's. I meant to post this apostrophe catastrophe on Sunday for my grandfather's birthday because he's the one who submitted it. Instead of throwing away this junk fax, he proofread it and saved it for me. I'd be willing to bet that Boppa is the oldest contributor to this blog. Is anyone else out there older than 95? Today is no ordinary Thursday; it's National Punctuation Day! What are you doing to celebrate? Thanks to Brian for submitting today's two-for-one catastrophe. 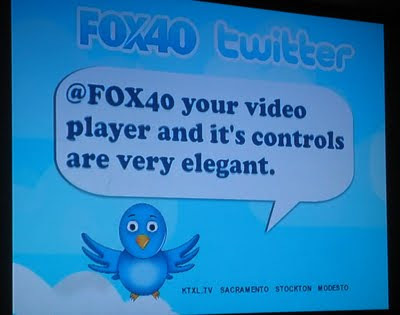 A little birdie told me that FOX 40 needs a grammar review. Just because it's not possible to put an apostrophe in a url, you shouldn't leave it out of the web site's title to match. Case in point: a blog reader named Chris brought Toms Angels [sic] to my attention. Toms Angels is a fansite for one guy named Tom (Tom DeLonge), but there's no apostrophe to be found anywhere. Tom looks kind of shocked that his fans committed an apostrophe catastrophe on a site devoted to him. Andrew, who spotted this apostrophe catastrophe near Cardiff, suspects that "the sign writer is a sandwich short." The sign is also missing one of the periods in the ellipses and could use some punctuation at the end of the slogan, as well. And see those yellow flags in the background? Those have apostrophe catastrophes in them, too! Thanks, Merry (and her Republican friend)! David Harris of the Cambridge Chronicle is responsible for bringing this comma calamity in Harvard Square to our attention. His blog tells us that the lack of punctuation in this subway ad is driving him crazy. Well, David, if you've gone crazy, take the T one stop over to Central Square. You'll fit right in. At least they got the you'res right! 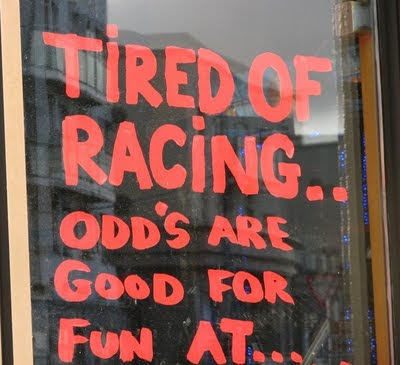 This arcade in Ireland wants us to know that odd is are good for fun there. Also, they're missing the third dot in the first set of ellipses. And shouldn't that be a question mark anyway? Check out Stan's English language blog here. Thanks, Stan! Jeremy from Hobart, Australia, writes, "Inspired by your blog, I took action to warn people of the catastrophe that someone had stuck on our work fax machine!" He also came up with the title of this post, which I think is quite clever. Knowing that I have a supporter in the Land Down Under sure brightens this dreary day. Today we're branching out a little bit from our typical subject matter and presenting a question-mark-and-spacing catastrophe. Debra, who found this catastrophe at a Dunkin' Donuts in Washington Heights, NY, writes, "I'm not sure if that is a serving suggestion or questioning the legitimacy of the food coloring." America runs on bad punctuation? I arrived at work this morning and found wonderful news in my inbox. My co-worker Paul informed me that there's an apostrophe catastrophe on an SUV in our parking garage! 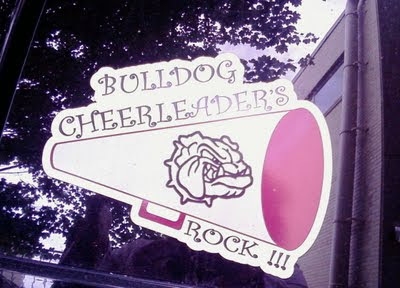 I looked at the sticker carefully to make sure it wasn't talking about one cheerleader's diamond. There were no geological formations to be found, so I captured the catastrophe on my trusty camera phone. Paul writes, with intentional apostrophe catastrophes, "Apparently the Bulldog's academic's don't rock." Can we get some laughing gas over here? 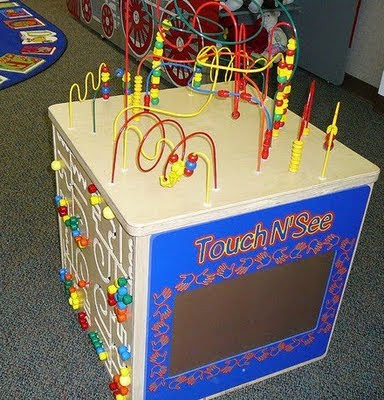 The Touch N'See lives in the library where Heather works, and it drives her crazy every time she looks at it. I can understand why! Clearly, whoever put up this sign at Big Bear Mountain is not an expert at punctuation. Also, what does the bottom part of the sign mean? 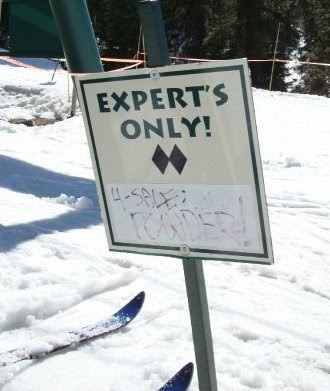 Is the ski lift operator selling cocaine? You know the expression "a face for radio"? Well, the first line of this e-mail would have sounded fine, but it sure looks ugly. The most obvious error is the it's, but that sentence is also missing a comma. I also think that the semicolon toward the end should be a colon or an em-dash. Thanks to my mom for sending this one in. Looking foward to seeing Bono and the boys with you on the 21st!